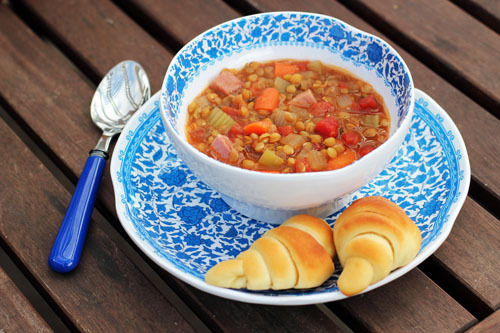 The moral of the story is that I have had this lentil soup recipe hidden away on my blog since Day 1, when I added a bunch of random recipes to the site from my recipe box (you know, the real live recipe box with notecards inside). But I’ve never actually written about this recipe because, well, I have no idea why! It’s about time because it really is a gem of a recipe. Plus, the soup looked gorgeous served in my new Q Squared dishes, which I was planning to write about anyway, so it was kismet! As you know, I’ve started working with a great company called Q Squared NYC. 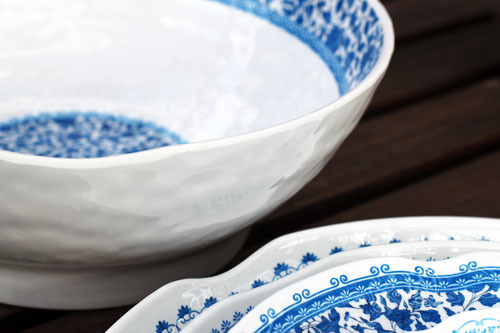 When I first received my Montecito dishes, I didn’t think I could love any of their other dishes more. 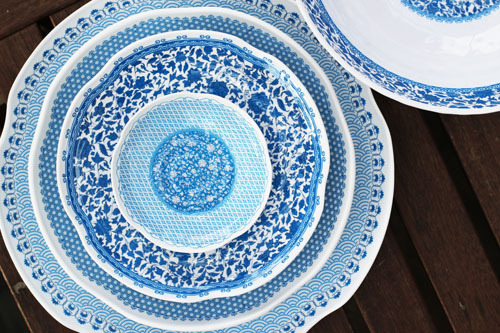 But for Easter I decided to use the Heritage line for all of our serving dishes and decorated the table with a blue and white theme to match, including the flowers. The table was simple and so pretty, if I do say so myself. And I really fell in love with the Heritage dishes. I don’t know, I might even love them more than Montecito. It’s just so hard to decide! Last night when I was photographing the orange-hued soup that complemented the blue in the dishes so beautifully, the girls started fighting over who would get to use the fancy bowl. I think I’m going to have to buy more of these dishes because I don’t think I’m the only one who loves them. Even Nate commented on how pretty they were after dinner on Easter and he’s a guy. In addition to the color and pattern, the Heritage dishes have a really great texture, with sort of a hammered look to them. I tried to capture this in the photography so hopefully you can see it. The dishes really are stunning and, like the Montecito line, you can tell they are really high quality. I could go on and on and ON about these dishes. 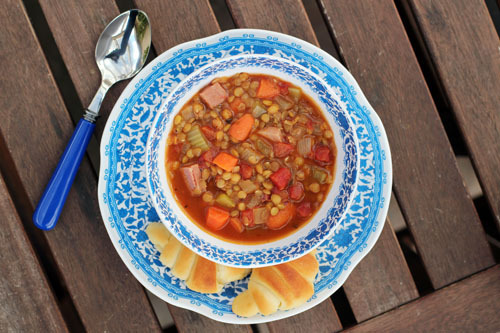 One last note on the recipe: you probably won’t like other lentil soups after trying this one. At least not as much! Honestly, whenever I have lentil soup at a restaurant I just end up disappointed. I now save all my lentil soup-ing for home, it’s just better that way. 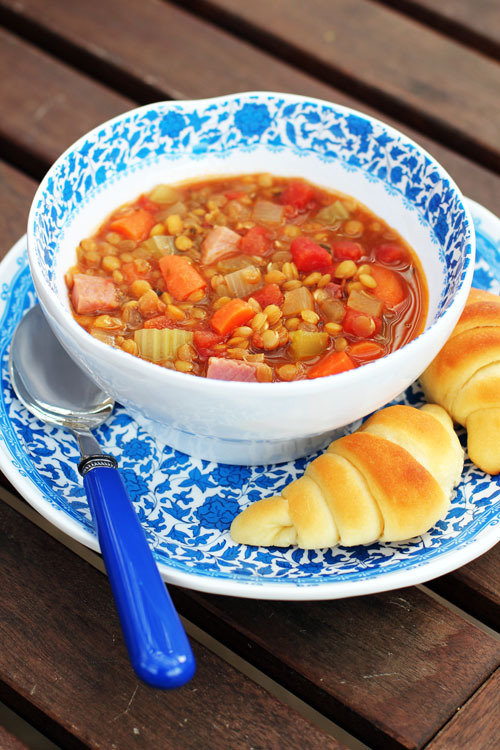 Oh, and one more last note: this soup is easy to throw together and is done in 30 minutes! Without further ado, I give you the soup! Everyone say thanks to Amy! Rinse lentils, drain, then soak in water and set aside while you prep the soup. In a large pot, cook onion garlic in hot oil over medium heat until tender but not brown. Once the onions are tender, add garlic and stir. Drain off any remaining water from the lentils. Stir in the lentils, beef broth, undrained tomatoes, worcestershire sauce, thyme or oregano, pepper, cumin, and bay leaf. Bring to boiling then reduce heat to low but so that soup is still simmering. Add carrots and celery. Return to boiling then reduce heat again and simmer for 15-20 mins or until lentils and veggies are tender. Stir in meat and heat through. Discard bay leaf. This post was sponsored by Q Squared NYC. As always, all opinions are 100% my own. The flatware pictured is also from Q Squared, part of the Provence Blue set. Seriously gorgeous. Love those contrasting colours together. We’re crazy about lentils over here. Can’t wait to try this soup! I was wondering how this blue pattern would do with colorful food, and they’ve worked great. we served the bright green asparagus on the plates on easter and it was gorgeous! I could use some fun new dishes. Feeling them with this delicious soup is a great idea too. it’s funny how much fun I’ve had having new dishes…it just adds a little breath of fresh air to everything! sounds like a great lentil soup! i really like red lentils and make a killer red lentil soup, but have made some really terrible lentil soups out of green or brown lentils. 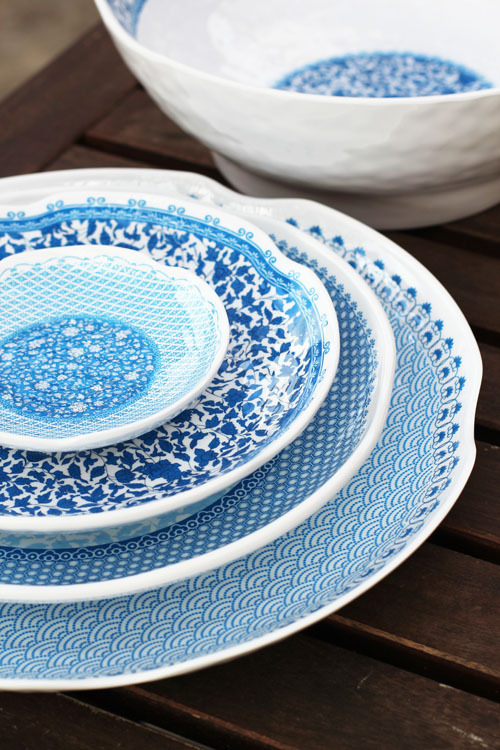 pretty dishes too! I need to try using red lentils! The dishes are so gorgeous I almost forgot about the soup! My husband is always after me to cook with lentils, so I will try this for sure. I’ve never even tried lentils!?! I should make this soup to try them! Too excited to make this soup that I threw everything basically in at the same time! ;-). Didn’t have Worcestershire sauce, so I substituted with soy sauce, little lemon juice, a pinch of sugar and a little of siracha sauce. Delish! yum yum! so glad you liked it!